With 77 series and up to 20 model variants per series, Linde Material Handling offers a product variety like no other manufacturer. 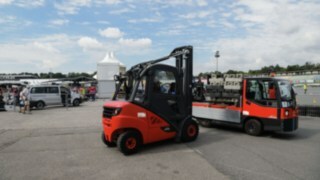 Each new forklift truck is individually configured to your needs. You can find an overview of our models here. 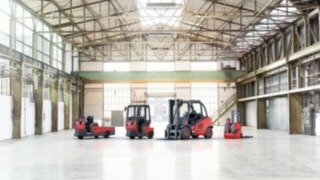 Whether your requirements stem from specific events, overflowing order books, or a forklift truck breakdown, the Linde rental service can quickly and flexibly provide you with a suitable forklift truck to rent for any period from one day to a year. You can find an overview of the models that are available to rent here. For which tasks do you need a truck? Which drive type do you prefer? What is the load you have to carry (in kg)? What is the height you have to lift your load to (in mm)?